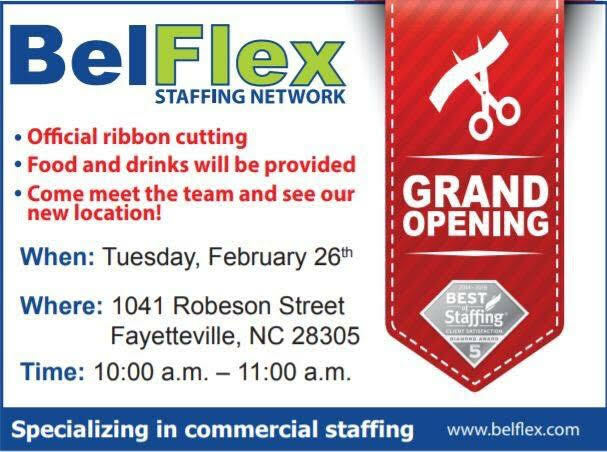 On December 10, 2018, BelFlex Staffing Network (BelFlex), acquired locally owned Cape Fear Staffing in Fayetteville, North Carolina. The Fayetteville location expands the BelFlex footprint in the region, which includes offices in Raleigh-Durham, Sanford, Clayton, and Winston-Salem, North Carolina and Greenville, South Carolina. BelFlex is driven by a passion for creating success for its employees, clients, and communities—what is calls Succeeding Together. BelFlex provides commercial staffing workforce solutions, from light industrial and administrative positions, as well as direct hire opportunities. BelFlex’s customers value its deep industry knowledge, recruiting expertise, a commitment to compliance, and partnering approach to improving productivity. Founded in 1989, BelFlex employs over 5,000 people through its 30 branch offices.